Join us for us for St. Patrick’s Day happy hour on Thursday, March 17th. We’ll be wearing green and serving specials from our happy hour menu. Come soak up the last few rays of the day at our patio tables while you enjoy a dozen oysters for only $9.95, or try our new beer on draft, Holy City Oyster Stout! Grabbing a healthy meal is easy when you stop by Amen Street Fish & Raw Bar for lunch during your workweek, or while you’re out and about enjoying the beautiful spring weather this weekend. Get the energy and nutrients you need to power through your day with one of our three delicious superfood salads. 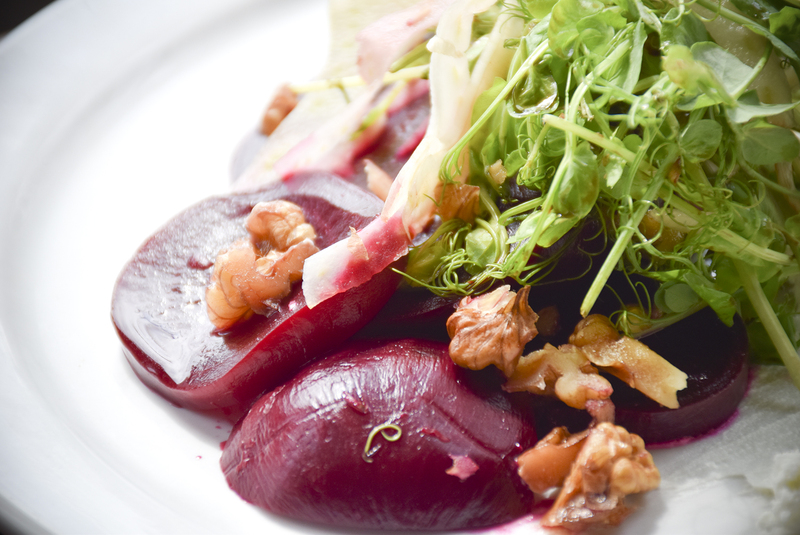 Fresh, locally sourced beats are roasted until they’re tender and rich in flavor, then served on a bed of arugula with goat cheese, shaved fennel, toasted walnuts and a house made sherry vinaigrette dressing. Beets and fennel are high in vitamin C and essential minerals like potassium and manganese, and fennel is also packed with heart-healthy fiber. Try this salad for refreshing flavor, and to give your immune system a boost that’ll help you avoid those pesky spring colds! Crisp julienned veggies and ripe grape tomatoes are served on a bed of mixed greens and topped with crunchy spiced almonds and Amen’s house made Green Goddess dressing. Tomatoes are choc full of antioxidants, and are a great source of vitamins A, C and folic acid. Add to that the protein, fiber, and high vitamin E, calcium, potassium and magnesium levels in almonds, and you get a well-rounded, healthy, one-dish power meal! Rich, leafy, locally sourced kale is topped with shaved radish, Parmesan and Asiago cheeses, a sprinkling of benne seeds, and a house made garlic-kale vinaigrette dressing. Kale is known for its host of nutritional benefits like high fiber and vitamin content, but kale isn’t the only part of this salad that packs a punch. Did you know that benne seeds (sometimes called sesame seeds) are rich in magnesium, calcium, iron, zinc and vitamin B? Or that radishes are packed with folate, fiber and potassium, and are thought to actually help eliminate toxins from the body? Add incredible flavor to the mix, and this salad is a treat for your taste buds and your body! Filed under Amen Street, Food, Shellfish. Tagged lunch, Raw Bar, St Patrick's Day.